Another Premier League fixture in Liverpool’s race to the title occurs this Sunday, as The Reds host Chelsea at Anfield. This is the last top six team Klopp’s men will face in the Premier League this season and both teams will be hungry for all three points. Chelsea are still battling it out for a top four spot whilst Liverpool are looking to get their hands on their first every Premier League title. Liverpool do not have a great record at home against Chelsea in the recent years. They have not beaten Chelsea at home since May 2012 when Jordan Henderson, Daniel Agger, Jonjo Shelvey and a Michael Essien own goal all helped Liverpool to a 4-1 win. Since that memorable win at Anfield, The Reds have failed to win at home, drawing five and losing two in the league. However, Chelsea do not have a good away record against fellow top six opponents. The Blues have lost all of their last five games away from home against the ‘big six’ teams, by an aggregate score of 1-11. Chelsea’s recent run of form has been good in the Premier League, Maurizio Sarri’s men have won three games in a row for the first time since September 2018, when they won all five of their opening games. Chelsea may look to bring Eden Hazard back into the starting line-up for the game at Anfield after he only came on as a substitute against Slavia Prague. Young, English man, Callum Hudson-Odoi may also make his second Premier League start as a Chelsea player after he was left out of the squad against Slavia Prague. After being told by Maurizio Sarri that he has no future at Chelsea, Danny Drinkwater doesn’t look like he will play in a Chelsea shirt again and will more than likely be shipped to another club in the summer. Now onto my predicted line-up for the game. I feel Sarri will start with his favoured 4-3-3 as he has stuck with the most this season. 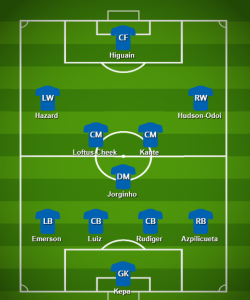 I feel Kepa Arrizabalaga will start in-between the sticks, in-front of Kepa I think the four-man defence will consist of, Azpilicueta, Rudiger, David Luiz and Emerson. I then believe Jorginho, one of Sarri’s favourites at the club, will start in the holding midfield position, along with Kante and Loftus-Cheek. I do feel Eden Hazard will start the game with Higuain at striker and Hudson-Odoi at right wing. This is another must win game for Klopp and his men as Man City are more than likely going to pick up all three points against Crystal Palace in the earlier hours of Sunday. If that is the case, this may put a little bit of pressure on Liverpool, but I still think we’ll come out with a win. I’m going to go with a 2-1 to Liverpool with Mane and Salah getting the goals. Tell me what you think the score will be, COME ON YOU REDS!! ‹ Starting XI: How should Liverpool line up vs Chelsea?